Block It is one of the 57 games published by Ketchapp Studio. It seems like Ketchapp always has at least one game on the Top Free list on App Store. Block It is a super simple short term game similar to Breakout, but without the blocks. The mission is to keep the ball over the lower level floor that the player can activate for a few milliseconds when the ball approaches. 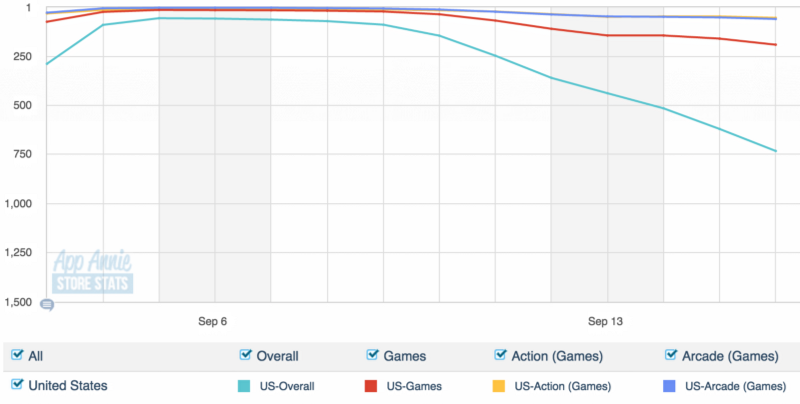 The game quickly went up the charts to the Top 100 Free apps in the US, but are now it’s on its way down again. It’s probably a combination of a short-term popular game, heavy cross-promotion within existing portfolio and virality. Block It has been doing really well for a few weeks, so we got curious to learn more about the game and decided to dig deeper to understand how they grow their player base from within the game. Sharing from the Game Over Screen: It’s really simple to share your high score. It’s also a natural place to share in between game sessions. Pre-defined text and image: An image of the highest score and text with download link is included as a suggestion when sharing. By providing pre-defined text, the number of steps to share is reduced and the likelihood of sharing increases. Share on multiple platforms: Facebook used to be the place to share (like Soda Saga and Angry Birds 2 still seems to believe), but today we are communicating on multiple platforms. It’s, therefore, important to let the players choose where to spread the word depending on who he/she wants to reach. Include links: When creating sharing functionality, always include a call-to-action so the recipients can easily learn more about the game and eventually download it. Use hashtag: When sharing something, #BlockIt is used with the pre-defined text. Teach your players to communicate about your game using a pre-defined hashtag. This will help your players find information and discussions related to your game. The chance of trending on Twitter increases with the more players communicating with the same phrase or hashtag, like we experienced with Fun Run. Although, it’s a little overkill to use hashtag in a text message as it’s not part of natural language and, therefore, reduces the feel of authenticity for the recipient. Aggressive cross-promotion: Never EVER start the game showing ads unless you are intentionally driving players to something else. Use cross-promotion at the right time, i.e. at the end of my game lifecycle when I’m likely to leave the game. Share GIFs: Let players share GIFs of how they lost instead of only images of the score. GIFs are very popular and give recipients a better understanding of the game than from an image.